Hellebore flowers open to five petals. What flowers in the cold? 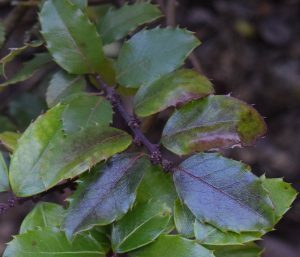 Whose leaves are green all year but are especially noticeable in late grey of winter? Well the title gave it away. Hellebores. Not a very pretty name but the name is as memorable as the flowers. The flowers are cup-shaped to start and open to five petals. Some have a prickly looking circle of stamens in the center. They almost look like the flowers you draw in kindergarten. Hellebores are evergreen perennials that grow in Zones 4-9. Depending upon the species and which zone they’re growing in, they may bloom anywhere from December to April. 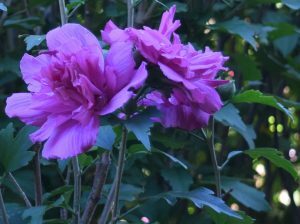 They generally bloom for four to six weeks. That means no matter how ugly the weather and how anxious you are to see spring arrive, Hellebores are in bloom. Most prefer a well-drained soil rich in humus. Most prefer an alkaline soil over acid soil. Location requires you to think about winter and summer. 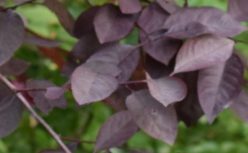 Planting under a deciduous tree (leaves fall off before winter) gives them the sun they need to bloom in winter. 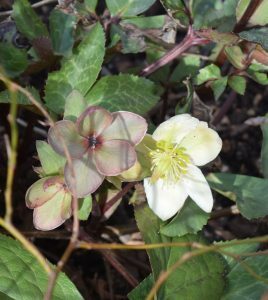 Once the leaves grow on the tree or bush, Hellebores are protected from the heat of the summer sun. So – winter sun, summer shade. Protect from wind when choosing a location to protect the leaves from wind burn. Some will self-seed and add new plants to your garden. Please Note: All parts of this plant are toxic to humans and pets. We normally eat only the fruits and vegetables we grow ourselves or that are sold in stores and markets. We know not to eat the flowers, bushes and trees that we grow in our gardens – that would make us sick. However, some plants have a special warning and Hellebores have that warning. Find a place to grow these plants where a curious child or pet won’t chew on them. Water regularly when you water other flowers in the summer. Add compost around plants every fall to feed them. Possible pests: slugs, aphids. Possible diseases: fungus – Botrytis. Well drained soil and good spacing between plants should help prevent these problems. When I first began gardening, the only kind of Hellebore available was one that had green flowers and supposedly smelled bad. I didn’t plant any, even though having an early flowering plant outside of my house was tempting. Now there are hybrids in many different colors from green to cream to pink, red and purple. No bad smell. My Hellebores are planted in an area that I can see from my back door. I enjoy their green leaves and pale-colored flowers without opening the door to the cold. Snooping through the garden plants on clearance is a little pastime of mine. Anticipation of a surprise builds – a good deal hidden at the back of the garden center. A once healthy plant like the one I’m looking at, in need of a little care, put on clearance. For less than the usual, often high rate, I get a new plant for my yard. I look at all the healthy plants at the front of the garden center. I check out names, price, and perennial vs annual, evergreen vs deciduous. After my walk-through inspection of the healthy expensive specimens, I head for the back of the garden center. Here clearance plants are grouped in several locations. No big signs. Yellow tags on the side of the containers let me know which ones are the potential deals. This day, a tall woman with short blond hair and two playful grandsons, is also looking around the bargain area. “See, it still looks green, just drooping. I know exactly where in my yard I’ll put it,” she says. “I have this cliff” she begins as lighthearted music plays from her purse. “And there’s lots of rocks thanks to my husband,” she continues while digging for her cell phone. “My husband put them there and I…” she says frowning at her phone screen “don’t like it.” She pushes a button on the phone. Hello,” she says into the phone. “Well, I’m here at the garden center talking to another customer. We’re looking at the bargain…boys,“ she says to her grandsons. “Yes I’ve got my grandsons with me… let’s not be so rambunctious,” she tells them. “What do you think of this evergreen here? “she says, looking at me with the phone still at her ear. “I think …” I start to say, but she is back to her friend on the cell phone. I smile and step over to the holly bush that caught my eye earlier. I move on to look at other prospects. My tall friend, her phone and grandsons are right behind me. She comments to her cell phone friend and to me, I guess, about each plant as I look at or touch it. Another customer joins in to look over the bargains. I finally decide I’ve seen everything available and am ready to circle back to the holly bush. I could use it in the back yard to help cover a fence. As I head for it my friend on the cell phone is still right behind me talking now about that holly bush and how she plans to use it by her front door. How does she know that’s where I’m going? I’m almost there when a woman with dyed reddish hair cuts in front of me and grabs the holly bush. She looks at it with satisfaction, smiles at all of us and carries it away. I smile, wave goodbye and walk toward the front of the store. Better luck next time I think to myself. Maybe I’ll be alone then. I can still hear on her phone behind me.